Paste papers, or Herrnhut as they are sometime known, are a cheap and simple style of decorated paper, created by brushing pigment mixed with paste onto paper and then making marks in the surface to form patterns or a design. Paste papers were in use across Europe from the 17th century, and were used extensively on bindings in Germany during the 18th century. The use of paste papers was less common in England; however, there is an intriguing account of their production in Fulneck, Yorkshire in the mid 18th century. 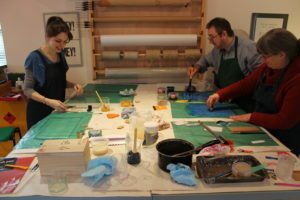 On Saturday 11th March I met with friends, and ex-colleagues, Royston Haward, Fiona McLees, and Linda & Steve Oriss at my studio in Oxfordshire to experiment making my first ever paste papers. The day came about because I couldn’t find anyone to teach me, so I decided to gather together a small group of professionals and have a go myself. Whilst researching the subject I was told that “the technique is simple, so most people make their own”, perhaps this accounted for the lack of courses available? Although I understood the basic principle I thought it would be more productive to approach the project with a group of other likeminded conservators and bookbinders. The day started with a look at some examples of paste papers. We had a few historic examples as well as some beautiful modern papers produced by Victoria Hall. We then read through some of the literature on the subject – a selected bibliography of paste papers is included at the bottom of this blog. The rest of the morning was spent preparing our materials and making up three types of paste: wheat starch, methyl-cellulose and flour paste. 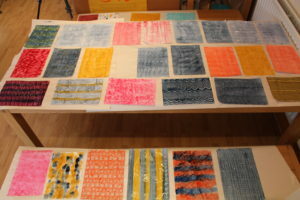 We had all brought various papers and pigments, including: acrylic inks and paints, water colours and gouache. The remainder of the day was spent trying out the technique. We started off quite tentatively, but before long we were making quite a mess and the studio was covered in papers drying. The theory is certainly simple (paper, pigment and paste), but the application is more complex, and the more intricate designs require great skill and dexterity. In our short session we quickly started to understand the properties of the materials, and which techniques and combinations were more successful than others. The day was a success as we managed to create some acceptable paste papers; however, the overall feeling was that there were many variables, and that it was only through repeated experimentation that we would start to achieve better results. Wheat starch paste proved successful – it was easy to use and worked well when recreating historic designs. Methyl-cellulose didn’t hold the pattern well, but it is used in many modern recipes, which suggests it is worth further experimentation. Likewise, we had limited success with flour paste, but we would suggest further experimentation. A lot of pigment was needed to create a deep colour. If using good quality artist’s water-colours or gouache this could prove quite expensive. Acrylic inks gave good bright results, but were less good for matching historic designs than water colours. We tried out a handful of different papers from cheap cartridge to handmade 100% cotton. There was not enough difference to draw any firm conclusions. Glass was a good working surface, it is wipe clean and supported the paper once dampened. Styluses need to be flexible – some more rigid cake decorator’s tools were too stiff and not successful. Mill-board combs were good but would perhaps not have great longevity. Experiments with stamps gave some positive results – the viscosity of the paste was an important factor when printing a design. Lino-cuts worked well but were difficult to lift up from the paper. Lots of space was needed to dry the papers! Named after a the 18th century Moravian Christians who produced paste papers in Herrnhut, Germany. See: Schmoller, T. A Yorkshire Source of Decorated Papers in the Eighteenth Century. Schmoller, T. A Yorkshire Source of Decorated Papers in the Eighteenth Century. Note: as one might expect, there are a number of publications on the subject in German, some of which are mentioned in Deborah Evetts’ GBW article. I too would love to try paste papers but can’t find a workshop!! Thanks for your summary and links – I think I’ll have to have a go by myself! Thanks for the comments Gill, I’m glad you found my blog useful. I have been developing my technique, so might run a workshop myself at some point. Try rice starch next time…… you will be very happy! Interesting, I’ll have to give rice starch a go, I haven’t tried that before. I have had a few more attempts at paste papers since writing this blog, each time improve a little.